Garrett Opperman kicks the soccer ball. The sophomore defender helped hold Penn State scoreless. 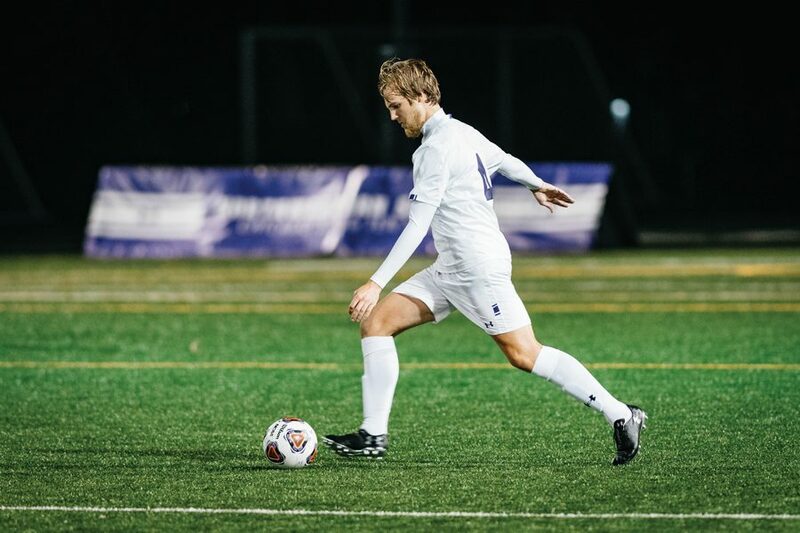 In a matchup of two teams looking to break winless streaks, Northwestern and Penn State battled for 110 minutes, but neither team broke through with a goal, resulting in a 0-0 tie. After losing to Notre Dame on Tuesday, coach Tim Lenahan preached to his team that it was a new season. Lenahan said the Wildcats played simply and moved the ball, which helped them create chances. NU (4-5-3, 0-3-2 Big Ten) took 17 shots in the game, the highest in any match this season, along with six corner kicks, its highest total since eight against UMKC on Sept. 9. “For most of the game, we were the protagonist and we were dictating the tempo,” Lenahan said. After the Cats came out strong in the first half, Lenahan knew the Nittany Lions would come out with some adjustments. Unlike in their previous games, he said NU did a good job of countering with tactical adjustments of their own. Even though NU outshot Penn State (2-6-2, 1-2-2) 6-5 in the first half, they were more aggressive in the second half, taking eight shots compared to the Nittany Lions’ four shots. But even with all of those chances, the Cats couldn’t put a ball in the back of the net. In overtime, Lenahan made tactical adjustments, but NU came out sluggish and didn’t generate nearly as many chances at they did in regulation. Lenahan said the Cats have to learn to find the balance between winning the game and maintaining their focus, using a quote from legendary NFL head coach Vince Lombardi to help explain his idea. Despite the undisciplined play of the offense in overtime, sophomore goalie Miha Miskovic and NU’s defense were locked in all game. Because of the pressure the offense put on the Nittany Lions’ defense, the Cats defense was able to limit Penn State’s possession. With the shutout, Miskovic has recorded seven clean sheets on the campaign. Despite his effort in goal, only four of those games have resulted in a win and none of them have come in Big Ten play. The Cats are still searching for their first conference win, but won’t have another opportunity to do so until Friday as their next game is Tuesday against DePaul. Regardless of the opponent, Lenahan knows the goal is just to win.